The plot is pricelessly preposterous, of course. It hinges on the prospect of a Middle-Eastern arms dealer Barkawi (Alon Moni Aboutboul) - in pursuit of revenge for his daughter who died in a drone strike - managing to infiltrate the British intelligence, plant heaps of his men in the police service, and gain access to London's entire CCTV surveillance system, all without getting under the radar of any intelligence agency across the world. Except, someone who could do that would practically own the world already. 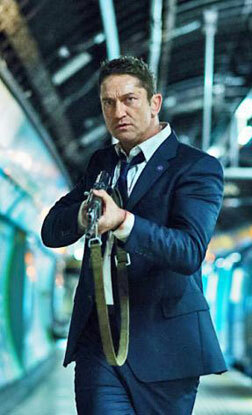 Gerard Butler knows this is his forte, and doesn't sweat it. He plays his Mike Banning-like Rambo, and is both trigger-happy and one-liner-happy. What we don't get is why he wouldn't go all the way and take that shirt off. None of the other actors is expected to go beyond what a daily wage paycheck would demand, and they don't try to, either. Morgan Freeman in particular, as Vice-President Trumbull, is as non-committal as a sophomore on his first date. Babak Najafi (Director) doesn't waste time on political correctness, consistency, state-of-art CGI or logic. He knows what he's been signed up for. Unstopping, adrenaline pumping action. He delivers it faithfully. Car chases, blasted choppers, underground gunfire, punchlines delivered after and during knife fights... they're all there with unerring regularity. And he has a knack for making it all move before you can think, and that keeps you occupied for this film's 90-odd minutes. You don't have time to ponder over things like score, dialogue, or performances when you're busy running from action set-piece to action set-piece. These scenes are well-choreographed, though. And that's about all the movie cares about. And that is also what your money's worth. This isn't exactly the film you need to watch in a theatre. That too with all the censoring benevolently bestowed upon you by the better-knowing powers-that-be. You are perhaps better off with catching this one on TV with a couple of beers when the missus is off to her momma's. Josh, Why there is no Zootopia review? fullhyd.com has 700,000+ monthly visits. Tell Hyderabad what you feel about London Has Fallen!